Glenn was born January 15, 1919, during World War I, to first generation Germans, Edward (an insurance salesman) and Laura Meyer. Glenn was raised three doors from 8th and State, with his four siblings and numerous aunts, uncles, and cousins, until the family moved to Riverside when he was in his teens. He graduated from Woodward High School in1937. After high school, he worked as an oil station attendant. On October 25, 1941, he replaced Elmer Ries as a Workhouse Guard when Ries joined the Cincinnati Police Division. Six week later, the Japanese bombed Pearl Harbor. Glenn was drafted into the United States Army. After basic training, he served as a light tank driver and mechanic. During August 1942, the Army sent him to Armored Forces School at Fort Knox where, in October 1942, he had graduated. They kept him there as an instructor. Then, he was a Platoon Sergeant in the Ordnance Company serving on the 2nd Army Ordnance Inspection Team. He never got to fight. Sergeant Meyer was honorably discharged on January 6, 1946 with a Good Conduct Ribbon. Four months later, on May 11th, he married Ruth Chaney of Price Hill. Five months into their marriage, Glenn joined the Cincinnati Police Division as a Police Recruit on September 1, 1947. He was promoted to Patrolman on December 1, 1947, issued Badge Number 350, and assigned to District 4 (1024 York Street). On September 10, 1951 he transferred to the prestigious Highway Safety Bureau. 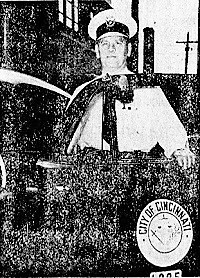 During 1957, Chief Schrotel chose Patrolman Meyer to represent the Division in a feature article in the Cincinnati Enquirer. He was promoted to Sergeant on July 11, 1965, issued Badge S-43, and assigned to District 2 (314 Broadway). On January 7, 1968, he transferred to District 5 (1012 Ludlow Avenue). His bosses’ impressions were universal but one commander summarized them in 1971: “an outstanding worker. Performs well in all areas of responsibility. Could sometimes be more tactful in commentary.” He retired on February 1, 1973 with almost 30 years of service to his country and community. Sergeant Meyer went to work in security at St. Francis Hospital (1860 Queen City Avenue). On August 2, 1976, he was named Director of Security and Safety. On April 19, 2015, when 99-year-old retired Detective Harry Leroy Keller passed away, Sergeant Meyer became the oldest retired Cincinnati police officer. He held the title almost three years. He was honored as such at the new District 3 stationhouse on July 11, 2017 and kept the crowd laughing with old police stories. Sergeant Meyer, living at the West Park Nursing Home, suffered a sudden decline in his health soon after his 99th birthday. By February 25, 2018 he was under hospice care. Sergeant Meyer passed away at 12:30 a.m. on March 4, 2018. He was 99 years and 1½ months old. He was predeceased by his wife of 63 years, Ruth Jane (Chaney) Meyer (2009). Sergeant Meyer is survived by his children, Robert A. (Jenny) Meyer, Jane Anne (Thomas) Lipps, Carole Abell, and Thomas S. (Heidi) Meyer; 10 grandchildren; and 10 great-grandchildren. Sergeant Meyer arranged for his body to be donated to the U.C. College of Medicine. A Celebration of Life Gathering will be held 1 p.m. to 3 p.m. on March 25, 2018 at St. John’s Westminster Union Church at 1085 Neeb Road. An FOP Service will be held at 2:30 p.m.
Memorials may be made to the Greater Cincinnati Police Museum, 308 Reading Road, Suite 201, Cincinnati, OH 45202. Thanks for your service. Mr. Meyer. My father was on the Cincinnati police force those same years. Herm DiStasi.